With just a couple of days to go until BetOnline Poker´s Main Event, take advantage of the final opportunities to satellite into the tournament cheaply. BetOnline Poker is one of the leading US-friendly online poker sites that welcomes players from all over the world. The site is particularly popular with cash game players because of its Bad Beat Jackpot and Cash Race promotions, but not a site you normally associate with valuable online poker tournaments. 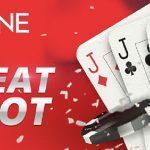 However, on Sunday, BetOnline Poker will be hosting the most valuable event in its monthly tournament schedule – the $100,000 guaranteed “Main Event”. 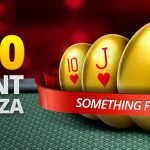 The tournaments has a direct buy-in of $109.00 and, over the next few days, players can take advantage of the final opportunities to satellite into the Main Event cheaply. The Main Event gets underway at 7:00pm (ET) with players starting with 3,000 chips. For the first 6 ten-minute levels, unlimited re-buys are allowed for players who chip stacks fall below 3,000 chips. At the end of Level 6, players have the option of a 6,000 chip add-on for a further $109.00. Despite the re-buy and add-on element of the Main Event, a significant overlay is expected. Late registration is open for just 50 minutes (five levels), by which time the starting stack will be the equivalent of 37.5 Big Blinds. The comparatively short late registration period deters players from entering the tournament at the last possible minute and running down the clock to achieve a min cash. We prefer this structure because it makes for a better game. One of the reasons why a significant overlay is expected is because, prior to a major tournament, most online poker sites host dozens of satellites feeding into the target event. Not BetOnline Poker. The site is sticking with its regular satellite schedule and providing only a limited number of opportunities for players to satellite into the Main Event cheaply. Today (Friday) the site is hosting $11.00 buy-in satellites every four hours – each guaranteeing two seats for the Main Event – and a $33.00 buy-in satellite at 10:00pm (ET) guaranteeing a minimum of three seats. Tomorrow (Saturday) there is only one opportunity to qualify cheaply for the Main Event – a $44.00 buy-in satellite at 8:00pm (ET) guaranteeing a minimum of four seats (don´t expect many re-buys and add-ons in this qualifier). On the day of the tournament itself, there are two $16.50 buy-in hyper satellites scheduled for 2:00pm (ET) and 5:00pm (ET). 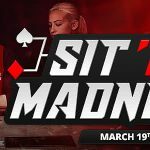 Each guarantees a minimum of three seats into BetOnline Poker´s Main Event and late registration is open for an incredible 19 three-minute levels. Due to the limited opportunities remaining to qualify into Sunday´s Main Event, there is unlikely to be any chance the satellites will be undersubscribed. However, earlier this week, one of the $33.00 buy-in satellites attracted just five players, and it is worth bearing this in mind ahead of next month´s $100,000 guaranteed Main Event on Sunday July 30th. In addition to the scheduled satellites, players also have the opportunity to qualify for Sunday´s Main Event via a Steps promotion. Each of the four Steps consist of a 6-Max Sit & Go, with the winner of each Step progressing onto the next – with the exception of Step 4, in which the winner will receive a seat in the Main Event. The Main Event Steps promotion has seen plenty of traffic this week due to players being able to buy-in each level of the promotion directly with cash (the buy-ins are $0.24, $0.67, $3.66 and $19.99) or with their Comp Points. However, the promotion will likely explode after tonight´s freeroll giving away thirty seats in the Level 1 Sit & Go games. The freeroll takes place at 7:30pm (ET) and has a regular freezeout format. Players start with 1,500 chips, with levels lasting ten minutes each. There are no re-buys or add-ons, and no late registration period. Although the freeroll is not the most valuable in the world, there will likely be plenty of interest in this event due to the prize at stake for players who reach the top level of the promotion. If the prospect of a significant overlay appeals to you, you should register for an account with BetOnline Poker before Sunday´s tournament gets underway. If you register your account using the BetOnline Poker bonus code “VIP1000”, you will be eligible for a 200% bonus on your first deposit up to a maximum bonus of $2,500. 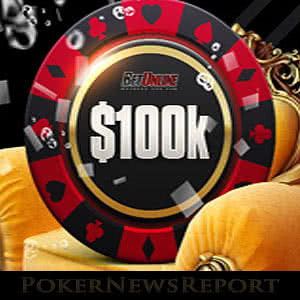 Please note this is an exclusive first deposit bonus for visitors to PokerNewsReport.com, and not available directly through the site (which only offers a 100% bonus on first deposits). 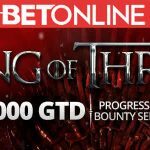 To find out more about this opportunity, and the other opportunities available at the site, you are invited to read our BetOnline Poker review.